I feel the job creation in our country has remained more or less static, though media reports are saying otherwise (that unemployment rates have reached the highest in 45 years). However, I feel there are layers to this issue and one cannot give an easy answer and that too in a country as huge and diverse as ours. Economic conditions, global competition, education, automation, and demographics all affect an individual’s job prospects. However, I feel it is not only important to just get a job to be call employed. Job satisfaction is important too. One should be happy in the job, should be paid well; the individual concerned should be given perks and facilities that are at par with global standards. When the rest of the world is talking about a 40-hour week, we in India only think about just getting a job. While on paper India also follows a 40- hour work week, the reality is that people in private sector end up working for over 60 to 70 hours a week, which spills over the weekends as well. Many countries regulate the work week by law, such as stipulating minimum daily rest periods, annual holidays, and a maximum number of working hours per week. Foreign countries are even particular about not sending emails to employees after work hours, but that is not the case in India. Employees need to be given the respect they deserve, be it white-collared jobs or blue or pink-collared jobs. I have heard of the Pradhan Mantri Kaushal Vikas Yojana that is aimed at enabling youngsters who have studied only till Class X or XII or have dropped out of the education system because of various reasons, to enter the workforce with the requisite industry-related training. The government bears the cost of these training programmes. Whichever party comes into power in 2019, they should ensure that people are accorded respect at the workplace, apart from good wages. As a Civil Service aspirant, I can say that if and when I become a civil servant, I will work to ensure that policy decisions are taken keeping every section of the society in mind. So far I haven’t figured out which party I am going to vote for, but I am more or less inclined in favour of the ruling party — BJP. 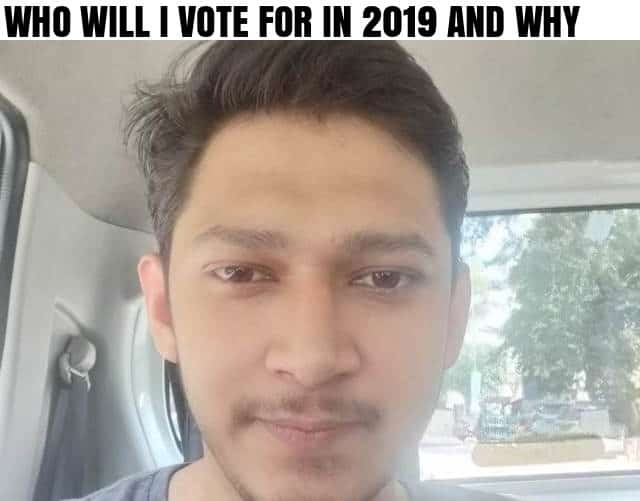 I take a keen interest in politics and I will make up my mind about who to vote for only at the last moment after having taken every important factor into account.